Thanks to the folks at Paragon Distributing, we’re pleased to announce that we will be raffling off a Large Big Green Egg with all proceeds benefiting the Friends of the Texas Freshwater Fisheries Center. YOU DO NOT HAVE TO BE PRESENT TO WIN!! Tickets are $10/each and may be purchased the day of the event. 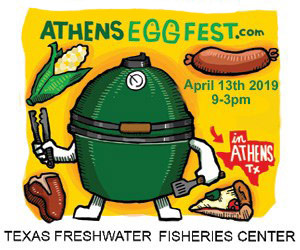 The winner will be announced at the 2019 Athens Eggfest on Saturday, April 14th, at approximately 3:30 p.m.